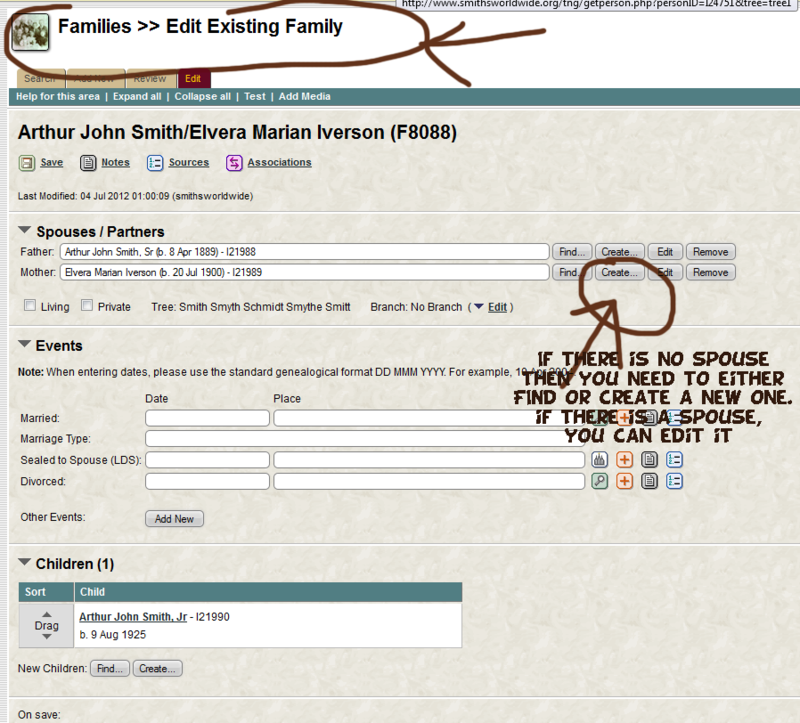 If there is already a family record but the record is missing the father or mother, then you can either click FIND (if you think the person is already listed in the database somewhere or CREATE. The screen looks like this. There will be a Father and Mother. Example: Suppose that there is a William Smith and but where it shows MOTHER it is blank. You need to CREATE the mother (wife) for this family. Then make sure you save your changes, TEST the page to make sure it looks okay. If you are on the PERSON record and wanting to add a spouse, AND THERE IS NOT A FAMILY RECORD ALREADY CREATED, you would add the first person, SAVE and then add the SPOUSE. Make sure that you save and TEST the page that it all looks correct. IF you are adding a new person and THEN adding a spouse, you will be CREATING a family recordfrom scratch rather than putting a spouse INTO an existing family record.